Today Bank of America sent someone to change the locks on Mildred Obi's home instead of having someone call Mildred and negotiate a deal that keeps her in her home and off the streets. Mildred was evicted last November after Bank of America refused the disabled senior a loan modification. The home has remained empty, Mildred became homeless, and her community became increasingly more upset. A line has been drawn in the sand. Bank of America will not push Mildred back onto the streets so easily. After the bank's locksmith showed up it was only a short period of time before Mildred's yard was filled by home defenders ready to put off any eviction. Mildred's community it committed to protect her home from Bank of America. 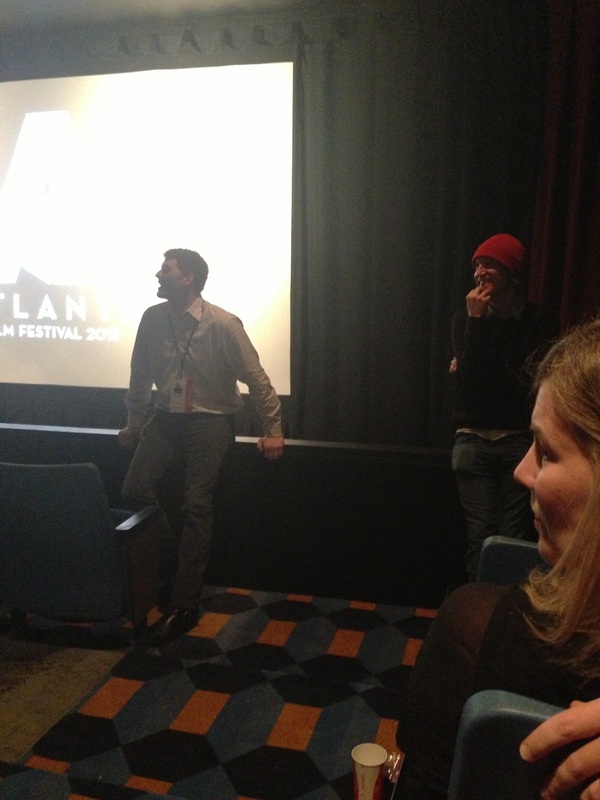 Today I had the honor to host a film screening of, "As Goes Janesville" at the Plaza Theater as part of the Atlanta Film Festival. The film tells the story of American austerity measures through the lives of Janesville, Wisconsin residents after a GM plant closes and right before Scott Walker is elected. Brad Lichtenstein, the director, does an amazing good pulling us into the lives of five main characters, each suffering consequences of economic crisis. 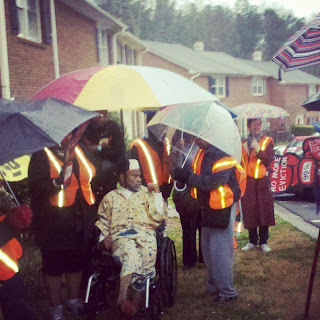 Today, a coalition of groups including American Friends Service Committee and Occupy Our Homes Atlanta, joined members of the Stone Mountain community to help Mildred Garrison Obi march to the home that she was evicted by force from just months ago. The purpose of the march was simple, move Mildred back into her home. She bought the house in 1998 for just over $70,000 with a mortgage from Countrywide. America sold her home on the Dekalb County courthouse steps. America and US Bank, who both refused to claim responsibility. 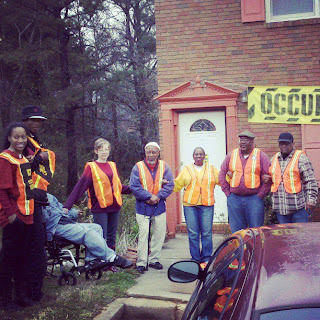 Today Mildred and her community approached her home holding banners and wearing orange vests emblazoned with Occupy Homes, chanting "ain't nobody gonna turn me around". 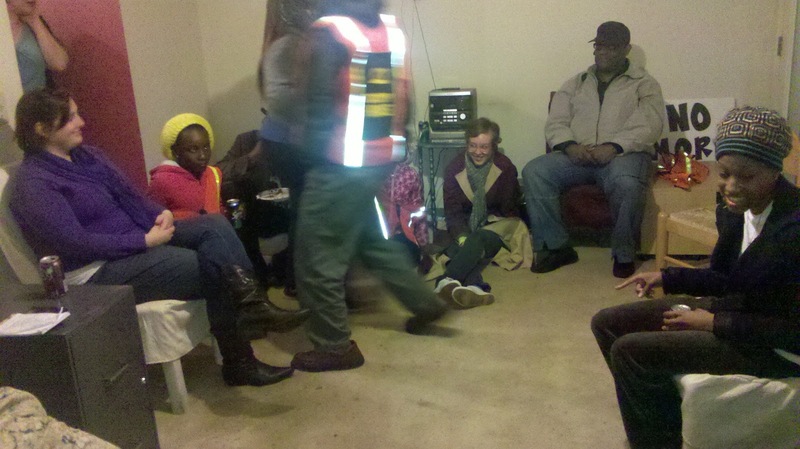 When they reached the house, people circled around to listen as Reverend Kelvin Peterson, Mildred's longtime pastor, recited a prayer, referencing the cruelty of leaving thousands of homes vacant while people were left out in the cold, repeatedly asking "where is God?" Emotions were high as Mildred finally approached the door to the home that was stolen from her. She turned the knob, and paused, with tears in her eyes, to make one simple yet powerful statement; "I'm not homeless. I'm not homeless. " Stone Mountain, and as Mildred emotionally stated earlier in the day, she's not homeless. 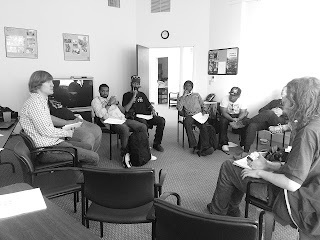 Today AFSC facilitated a media training designed to help folks develop a strong media strategy to not only effectively use the power of the mainstream media to engage the community on important issues, but to simultaneously develop capacity to be their own media. 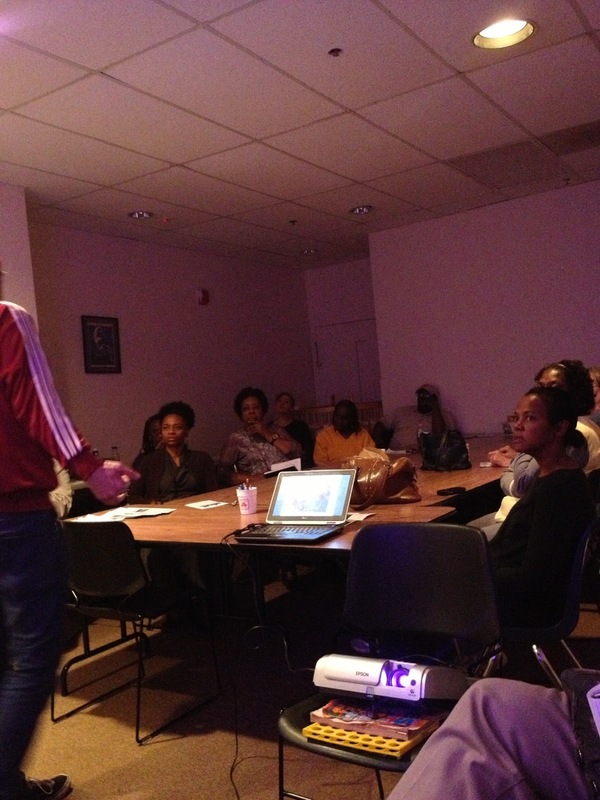 The workshop was a part of an ongoing series of organizing trainings in partnership with the Atlanta Free School project. The workshop covered best practices on mainstream media outreach, press releases, interview role plays, messaging through images, and using social media. Mark Harris, an Occupy Our Homes Atlanta member who has been fighting Fannie Mae for his home since last fall, was joined today outside their regional headquarters by dozens of supporters, and community members, including American Friends Service Committee, Atlanta Jobs With Justice, Teamsters Local 728, and the SCLC. Mark, a Desert Storm veteran, had his home foreclosed on back in October while he was still attempting to work out a solution with his servicer. Since then, Mark has traveled to DC to meet with Fannie Mae executives, and collected over 9,000 signatures on a petition created on Start2.occupyourhomes.org. Despite this, Fannie Mae has refused to keep their word and negotiate in good faith, and are attempting to move forward with an eviction. At the action, activists built a mock house, representing the thousands of homes across the country that Fannie Mae has taken from communities. Once the house was built, the group joined in a prayer, followed by veterans speaking out against the injustices they face when returning home after serving their country in the military. The coalition used the opportunity to do an eviction defense training around the house that was built, sending a message to Fannie Mae that Mark’s home would not be easily taken from him. 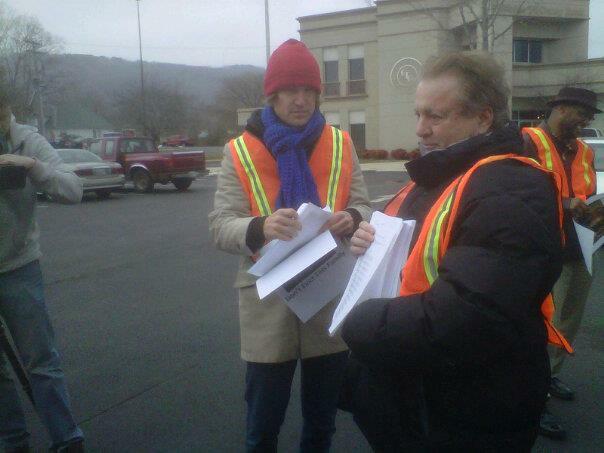 The group then lined up behind Mark as he peacefully attempted to deliver his petition signatures to Fannie Mae. The building’s security guards wouldn’t let him through the entrance however, but agreed to make sure the signatures were received by Fannie Mae. Mark was joined by several home defenders, some who had previously fought and won their homes back from the bank, as well as others who are still in the process of fighting along with him. 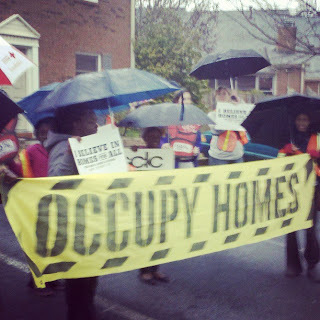 Today’s action was also part of the launch of the national ‘Homes For All‘ campaign, led by the Right to the City Alliance, which is joining together homeowners, renters, homeless, and public housing residents to fight for action on housing, and further the movement to establish housing as a human right for all. 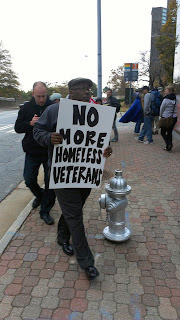 Wednesday March 13th from 1:00-3pm at Fannie Mae’s SE Regional Office(950 E Paces Ferry Rd, Atlanta) Occupy Our Homes Atlanta and allies plan to creatively protest Fannie Mae’s decision to move forward with the eviction of Desert Storm Veteran Mark Harris. “We plan to build a mock home in front of Fannie Mae’s HQ to represent the millions of homes Fannie Mae has foreclosed and left empty in our Country. 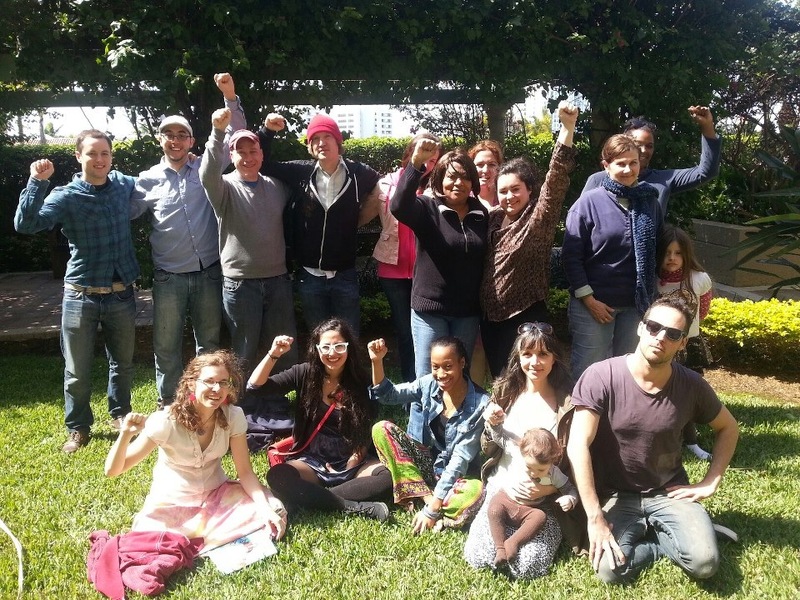 We need solutions, not evictions and foreclosures” said Occupy Homes Organizer Shab Bashiri. Mark Harris recently took his struggle all the way to DC, where he met with high level Fannie Mae executives who promised to look at creative solutions to keep Mark from becoming another homeless veteran. Since then Fannie Mae has made no real effort to create a deal that keeps Mark in his home, it’s clear that they intend to move forward with eviction, even though Mark has made reasonable offers on the house. “This marks a critical turning point where worker organizations are taking a stand against the greed of Fannie Mae.” Said Jobs With Justice organizer Roger Sikes. “ We understand the leading causes of foreclosure are unemployment, and underemployment. We need full and fair employment for our community members and we will to fight to keep workers in their homes. Unions stand with workers inside and outside the workplace.” Said Teamster Organizer Ben Speight. Mark will be joined by a number of veterans who plan to speak in Support of Mark’s struggle against Fannie Mae. 1/3 of Atlanta's homeless population are veterans, and for every one of them there are six empty homes, many of which are owned by Fannie Mae. "Fannie Mae wants to kick Mark Harris out of his home and then for an investor, or someone else, reset the mortgage fairly to the current home value. This is an outrage. And this is why we are organizing Fannie Mae residents nationally to demand principal reduction," Rachel LaForest, Homes For All campaign. During the demonstration Mark Harris plans to deliver a petition that 9k people across the country have sign in support of his struggle. “As a veteran, I thought the toughest battles were behind me. I never thought I’d be struggling to keep a roof over my head. I fought for this country, so I know I have a right to fight for my home!” States Mark Harris. This action, one of 11 around the country, is part of the launch for the Homes For All campaign uniting homeowners, renters, public housing residents and those who are homeless to fight for affordable and secure homes. 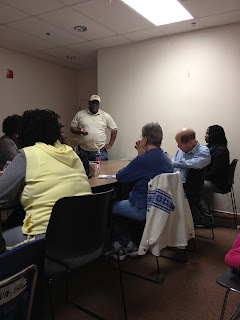 Today over 30 people came together for a housing justice meeting in Stone Mountain. 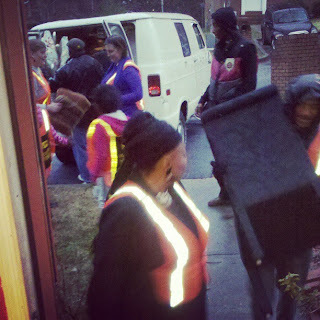 What precipitated the gathering in was the recent eviction of longtime community activist Mildred Obi. Although the communities love for Mildred certainly brought folks together, it was clear that she's not the only one experiencing hard times. 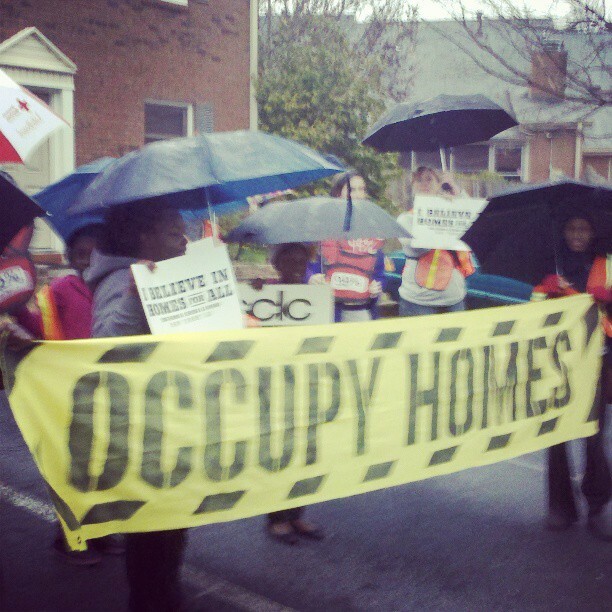 We heard from multiple residents facing eviction and foreclosure. For a first meeting of it's kind in Stone Mountain I was surprised how fired up and excited folks were about organizing their neighborhoods to resist evictions and foreclosures. We will be hosting a second meeting this Saturday at 1pm, venue will be posted by Monday morning. 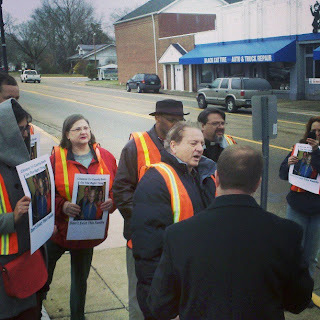 This past Wednesday, Housing Justice Advocates held a press conference and demonstration alongside the Horn Family in front of Citizens Tri County Bank headquarters in Dunlap Tennessee. Helen Horn is 86 years old. She current suffers from advanced dementia. Helen and her husband (now deceased) had a small retail business on the front street of their small town for 60 years. They did everything right. They had excellent credit. They taught their children, Terry and Cheri right from wrong, most importantly, to do unto others as you would have them do unto you, and to always take care of the less fortunate. Besides their retail business they invested in property on the side because they wanted something for their retirement and they always wanted to give something to their children. In 2008, the economic crash hit. Helen’s husband was dying. The four investment properties she had were foreclosed upon by Citizens Tri-County Bank. Citizens Tri-County Bank then claimed this wasn't enough to pay the debt. Knowing that her house of 45 years was free and clear, they are attempting to place a lien on the home in order to repossess it, which would leave her homeless. When the bank found out she transferred the home to her adult children 18 months ago, they sued her children for fraudulent transfer. The Bank is determined to get the home. Our message to Citizens Tri County Bank was simple; you've gotten enough out of this family. It's time to do the right thing and make a deal that keeps the Horns in their home. 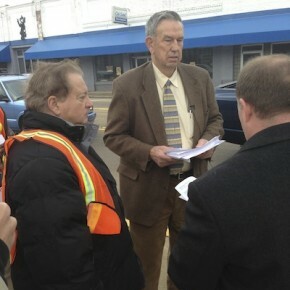 One of Terry's goals was to delivering a petition, which had been signed by 7,131 people all over the Country to Citizens’ Tri-County Bank CEO Glenn Barker after holding a brief press conference outside the bank. The unexpected happen, Mr. Barker walked right out of the bank during our press conference, while Terry was speaking, and made a statement. It was hard to understand exactly what he was trying to say but it was something along the lines of, "we can't relieve all of our costomers debts". This past weekend, the American Friends Service Committee joined representatives from Occupy Our Homes Groups, Occupy Fights Foreclosure, Chicago Anti-Eviction Campaign, Home Defenders League, Springfield No One Leaves, and the Housing Justice Foundation. 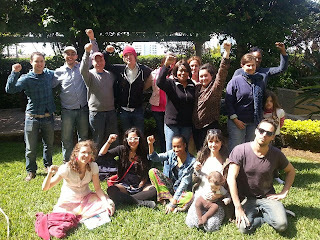 The gathering was organized by the Housing Justice Foundation with a simple goal; to bring leaders in the housing justice movement together in order to share our successes and shortcomings, and begin to build a stronger collective vision of what more organized national coordination could look like. 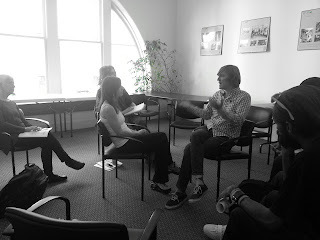 One thing that struck me was that many group's struggles were other groups strengths; this dynamic offered lots of practical skill shares. Perhaps more important then anything is the opportunity to put a name to a face and build real relationships with folks doing this work around the country. A big thanks to the Housing Justice Foundation for making the gathering happen! 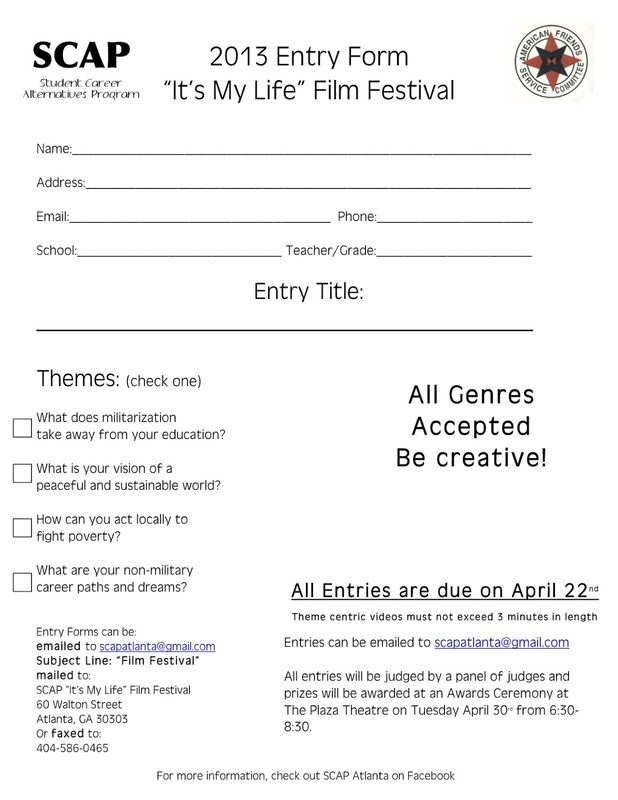 Student Career Alternatives Program (SCAP) is hosting it's third annual It's My Life contest. This year we are sponsoring a Youth Made Film Festival encouraging metro Atlanta youth to create short, theme centric films. 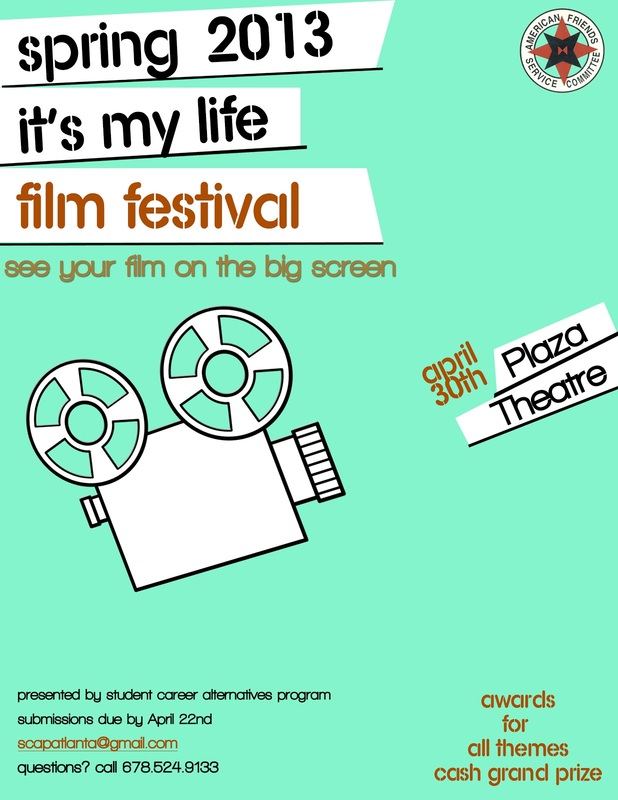 The film genres can span the whole spectrum from animations, documentary, music video, narrative to spoof. The themes chosen will hopefully encourage thought in those areas and broaden students outlooks as they prepare for the next step in their lives. 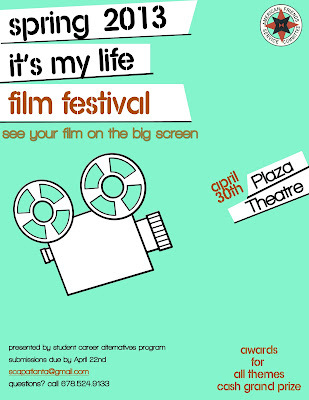 All entries will be screened at the Plaza Theatre April 30, 2013! Prizes will be awarded to every theme and a cash grand prize! Teachers, schools, and youth clubs have been notified via snail mail, email, and phone call. NOW we are preparing to go to schools and youth groups to discuss, encourage, and promote the festival with students and answer any questions. 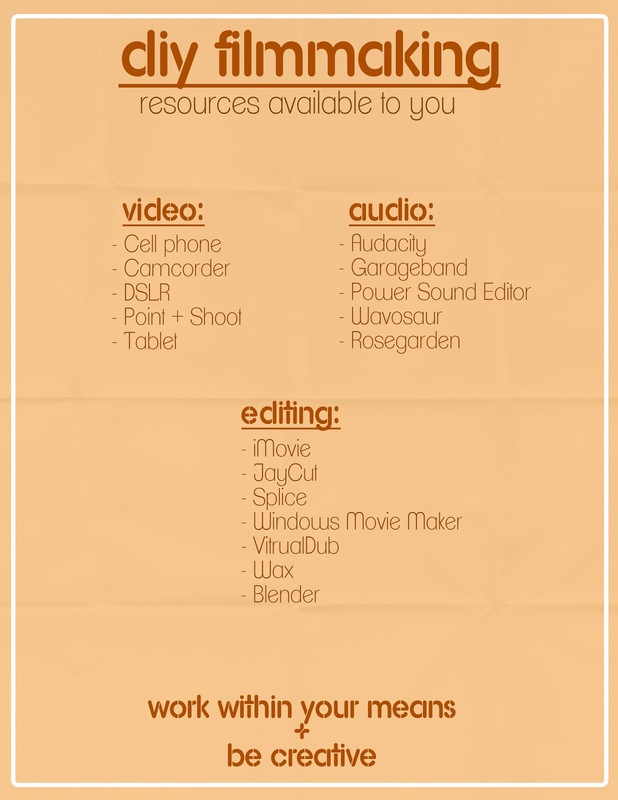 Additionally we need folks with video/editing/storytelling experience to work with youth in a workshop or classroom setting. 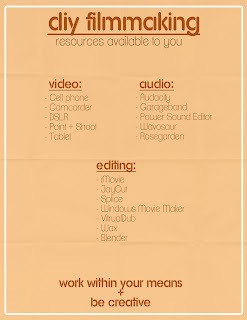 Filmmaking can be overwhelming and we wish to encourage students to work within their means and utilize the tools available to them. Let's make this a success! !